Montreal, Canada: Ronalds Company Limited, 1931. 31 pp. Fine volume has lightly tanned spine, Slipcase is worn, nearly good. With frontis illustration and first-page vignette. One of 275 copies, printed as Christmas gifts. Miladi is set in the time of the French Revolution. ''As far back as I can remember I see again two quiet, smiling old ladies, the Marquise de Flavigny and Mlle. Odile. A great familiarity seemed to exist between these two aged women, who, while knitting for the poor, exchanged endless confidences, in a low voice, with an air of camaraderie, almost conspiracy. Some days, important house-cleaning days when no knitting was done, the two friends ransacked their clothes-presses, dusted and polished all day. // At the bottom of one of these mysterious presses, as in a shrine, reposed, upright in a glass box, an object for which the two ladies seemed to have a sort of veneration. It was a large doll dressed in an old-fashioned robe of worn-out silk. The years had made it almost bald; its nose was broken, its hands and face were chipped, the enamel was all off and I recall that it had only one shoe, an old shoe of morocco leather, all cracked, with a buckle of blackened silver and a high heel which had once been red.''. Limited. Decorative-Paper boards. Fine. 4to - over 9¾" - 12" tall. Buffalo, New York: Meow Press, 1995. 35 pp. An edition of three hundred printed in May 1995. 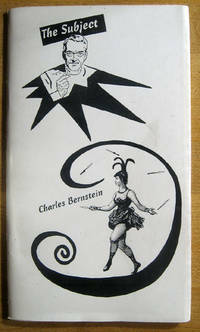 A play in verse from a scenario by Ben Yarmolinsky and Charles Bernstein, music by Ben Yarmolinsky. First Performance February 23, 1992, with Carla Wood as Jenny Midnight, Tom Bogdan as Daeman Dudley, and Stephen Kalm as Boris Frame. Cover art by Susan Bee. There's a bridge / I can't cross / melting like a / boy with pickled / eyes. She breaks / the board over / the crystal desk / embodied with heiroglyphic / inscriptions then hides / under the folds / of the tears / mumbling about frozen / papaya and the / boat to Tonawanda.' --Jenny Midnight from Part One: The Crystal Desk.. Limited. Wraps. Fine/Near Fine. 8vo - over 7¾" - 9¾" tall.